Are Gas Ranges a Potential Carbon Monoxide Danger? – ScienceMan! 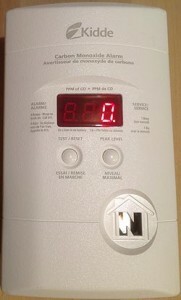 Most of us have carbon monoxide detectors in our homes, but don’t give them a second thought. That was the case for me as well, at least until yesterday. While hacking away at the computer, I was startled by a repeating series of deafening beeps – once my slow brain figured out that it was not the smoke detector, I noticed that display on the CO detector was flashing with a reading of 357 ppm. It turns out the flashing meant that it was displaying a peak value – once I reset the unit, it read steadily around 40-50 ppm. Considering normal atmospheric levels of CO are less than 1 ppm, those numbers are unacceptably high. Most worksite regulations prohibit exposure to 50 ppm CO for extended periods of time, so certainly you shouldn’t have those levels in your home! Check out this page – it has great description of CO levels and their potential dangers. The first thing I suspected was our furnace, but the weather was still warm, so it wasn’t even running. So I moved around the house, and quickly noticed that the readings got higher in the kitchen, and were very high (400 ppm!) by the gas stove. My wife was doing some baking, so needless to say I turned it off! This immediately stopped the source of the CO – and opening up some windows quickly brought the CO levels back to less than 1 ppm. Obviously, our gas stove needs servicing. With a little web research, I was very surprised to learn that excessive CO production by gas ranges is actually quite common. The leading culprits are improper gas pressure, and more commonly, incomplete combustion caused by faulty burners. I don’t have any Earth-shaking conclusions to this story – just sharing something that was surprising to me, and a reminder to make sure you always have a functioning CO detector in your home.